If you didn't know Demi Lovato was confident, PSA: she is. Honestly the whole lead-up to this album was just an exercise in total bad-assery, and unsurprisingly, the music delivered. On the real guys, Confident is good. And I'm not just saying that because Demi is taking me on tour with her in Europe on the next episode of Path to Fame. I was already down with the first two tracks, "Confident" (probably my favorite track on the album) and "Cool for the Summer," so it was a few minutes before I heard something new. But when I did, I was ready for life because "Old Ways" is the anthem I didn't know I needed. Like if you need a new pump up song this is it people I'm telling you. Another excellent getting-ready-to-go-out-with-your-girls song is "Stars," which I swear has Miley Cyrus on backing vocals (just me? ok). One of my faves though is "Mr. Hughes" (deluxe edition), which is giving me this Amy Winehouse-soul kind of vibe that Demi really werks and I am totally digging. It would've been easy to overload this album with girl power sassy confident anthems, which yes we all need, but Demi didn't do that. She also popped in some really thoughtful tracks as well, which showcase her beautiful voice and have a message of their own. My favorite of these is probably "Father," a stripped down letter to her late dad. Each track has its own vibe, but they all come together to say the same thing, and that's that DD knows who she is and she won't let anyone get in her way. Like don't even try or Demi will mow you down. This album isn't someone playing at being confident or someone who's young and thinks they know what's up. 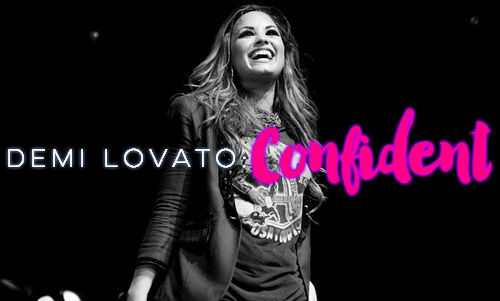 Demi really is, and she really does.